Can energy companies keep critters safe and customers happy? After tree and storm damage, animals cause the most headaches for energy companies and the customers they serve. And in all of critterdom, squirrels are Public Enemy No. 1. But snakes, raccoons and birds also damage the infrastructure. One small rodent can knock out power to thousands of people. Duke Energy attributed more than 1,000 outages to squirrels in its service areas last year and more than 1,000 outages to a variety of other animals, such as vultures, snakes and raccoons. As part of Duke Energy’s efforts to Build a Smarter Energy Future, the company is investing $25 billion over 10 years to modernize the power grid, including $3.5 billion in North Carolina alone to prevent outages. That includes retrofitting 400,000 transformers to prevent animal interference and lightning strikes. To deter critters from disrupting power and hurting themselves, Duke Energy has found that the best offense is a good defense. Covering equipment is the first line of defense. Designing structures that are less accessible to animals means covering up powerlines and insulators. Power line spinners deter squirrels. Spinners consist of two free-spinning wheels that act as a jump barrier, with five rollers spinning on the line. Line and pole squirrel guards are installed on phase and neutral conductors and are positioned so the animals will fall outside of any substation fencing. Conductor lead wraps and tape are installed on all leads throughout substations. And animal guard discs are used to block animals from climbing conductors. One of the more pesky critters is the buzzard, which leaves droppings that lead to outages. Plexiglass shields have been installed at substations to cover equipment. 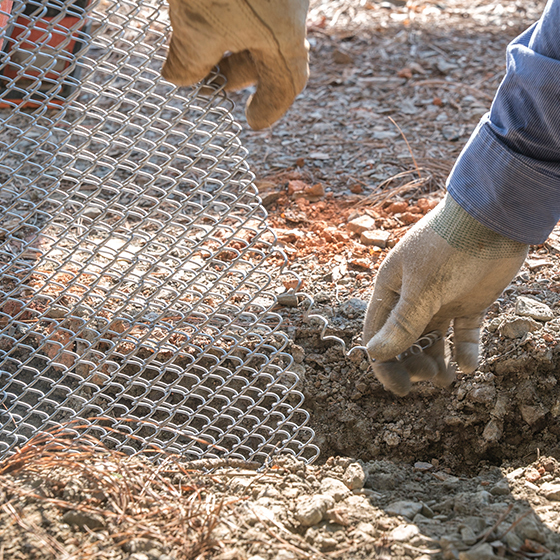 A mesh fence installed around substations has small holes (3/8-inch) that are too small for critters, even snakes, to crawl through. The top of the fence has an outward-facing slope that prevents creatures from crawling over the top. None of the deterrent methods will be effective if the area around the perimeter of a substation, including vegetation and fencing, is not maintained. Bird nests are relocated as soon as possible. Birds contribute to outages, and snakes and raccoons are attracted to nesting birds. Duke Energy takes great strides to do as little harm to animals as possible. The Natural Resources group manages an avian protection program. This plan outlines ways to keep birds safe on power lines. Duke Energy has built platforms or provided nesting boxes for birds as an alternative to using equipment. It’s all about maintaining a balance: keeping the lights on and the animals alive. 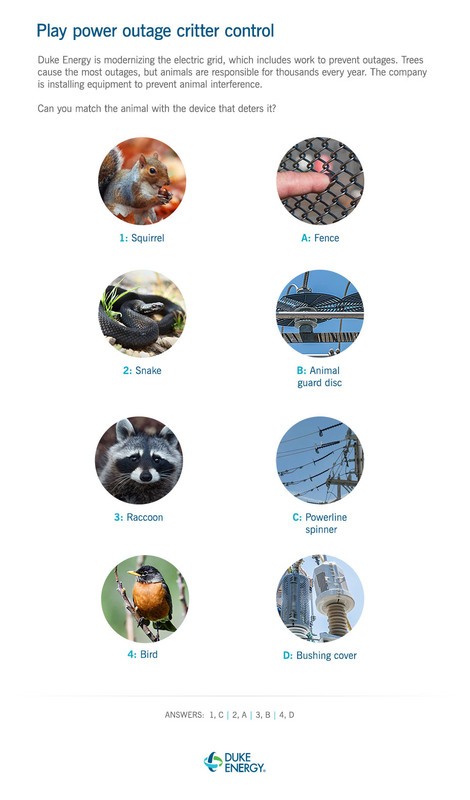 The cybersquirrel website tracks animal outages. Click the link if you want to see what animals have caused outages around the world.